Hundreds of supporters of former Iraqi leader Saddam Hussein have been protesting in the cities of Baghdad, Tikrit and Samarra against his hanging. Many of the protesters vowed revenge for Saturday's execution, describing it as a criminal act of cowardice orchestrated by American overlords. The Sunni Arab demonstrations came a day after celebrations in Shia areas. 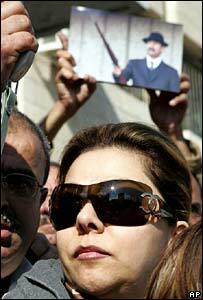 Saddam Hussein's eldest daughter, Raghad, joined hundreds of people in a protest in Jordan's capital Amman. "God bless you! I thank your for honouring Saddam the martyr," she told the demonstrators, in a surprise public appearance. The former president's two older daughters sought refuge in Jordan four months after the US-led invasion in April 2003. Further protests were reported around the Muslim world, including in the Palestinian territories and Indian-administered Kashmir. Iraqi Sunnis protested in the Adhamiya district of Baghdad, in their Samarra stronghold and Saddam Hussein's home town, Tikrit, where he has been buried in his family's plot. In Tikrit, mourning tents were erected as security forces sealed off the town for the third day in a row. Correspondents say that while the demonstrations were not huge they underscore the deep sectarian divide that threatens to tear Iraq apart. Among the chants were slogans such as "Saddam is the pride of the nation" and "We sacrifice our soul and blood for you Saddam". One protester carried a banner that read: "The martyrdom of the father of two martyrs inspires the resistance to victory," a reference to Saddam Hussein and his two sons, Uday and Qusay, who were gunned down in a battle with US troops in 2003. The BBC's Peter Greste in Baghdad says Prime Minister Nouri Maliki had hoped Saddam Hussein's execution would encourage some of his Sunni supporters to give up their weapons and join the political process now dominated by the majority Shias, but instead it seems to have widened the cracks. The former president, 69, was hanged early on Saturday morning after being sentenced to death over the killings of 148 Shias from the town of Dujail in the 1980s.